Open Campus at JAXA Sagamihara! Click here for the Open Campus brochure. 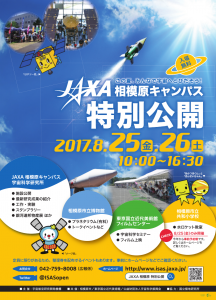 On Friday August 25th and Saturday August 26th, our JAXA Sagamihara Campus will have a special public open day! A free bus will run from the south exit of JR Fuchinobe Station or it is a 15 – 20 minute walk to the campus. Look out for the MMX booth at station 5! 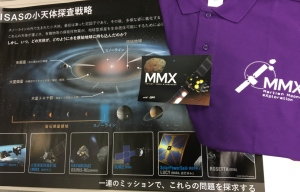 Our Martian eXploration Mission (MMX) booth is at the 5th station on the first floor (map here). We are easy to spot in our purple MMX shirts. Please come and visit us and pick up a mission postcard and poster of our plans for Solar System exploration. We look forward to seeing you! An itinerary for the two days and more information can be found on the Open Campus Website (Japanese only).